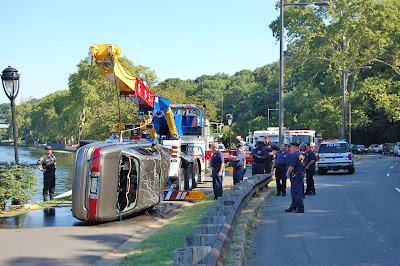 A stolen car went flying across the Kelly Drive trail and into the Schuylkill River on Friday morning about 8:00 a.m., at the sharp curve just north of Boat House Row. Luckily no trail users were hurt. Driver swam to safety and is in custody. 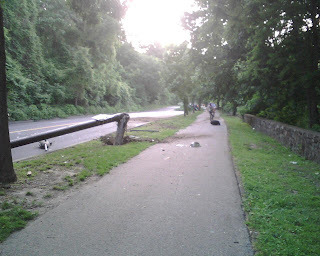 BCGP member Mike Szlagyi who saw much of the melee asked a pointed question: Would Fairmount Park consider installing a barrier the whole length of River Drives to protect trail users? Check out this posting of an out of control car that narrowly missed a cyclist on the MLK Drive path in June. It really is a matter of time before a tragedy occurs on these busy paths. Speaking of going too fast, have you seen the UK safety ads "The faster you go, the bigger the mess"? e.g. this one here. They're pretty horrifying but something we all need to be reminded of. If the city could erect large boulders between the road and the trail at danger points, such as but not limited to the bend on Kelly Drive at Boathouse Row, joyriders would think twice before trying their Joey Chitwood imitation along busy highways. If a double-sided guardrail is what it takes to keep the bike/foot trail safe, then let's do it. One tragedy is one too many. It's easy to say the police need to do a better job of enforcing speed limits, but hey, they can't be everywhere at once.